As is typical for September, members of all three pods have been traveling together. 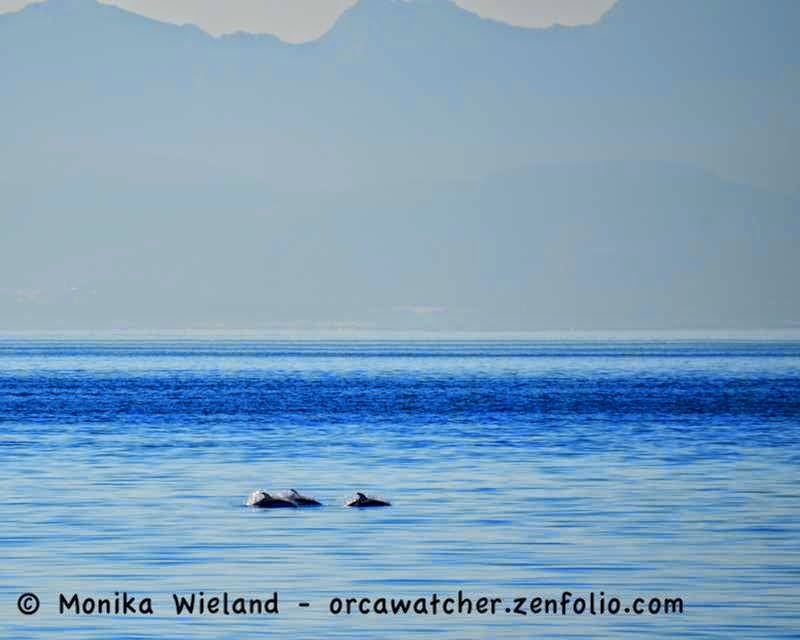 They've been coming and going regularly in and out the Strait of Juan de Fuca, spending a day or two here and then going out west for a day. I made an early morning of it before work on Thursday, September 11 on the west side. I met up with some other hopeful whale waiters, but unfortunately there were no orcas on the west side. The trip out there was not for naught, however (it never is). I saw both Vaux's (181) and black swifts (182), finally adding some birds to the year list, which had been stagnant since July! 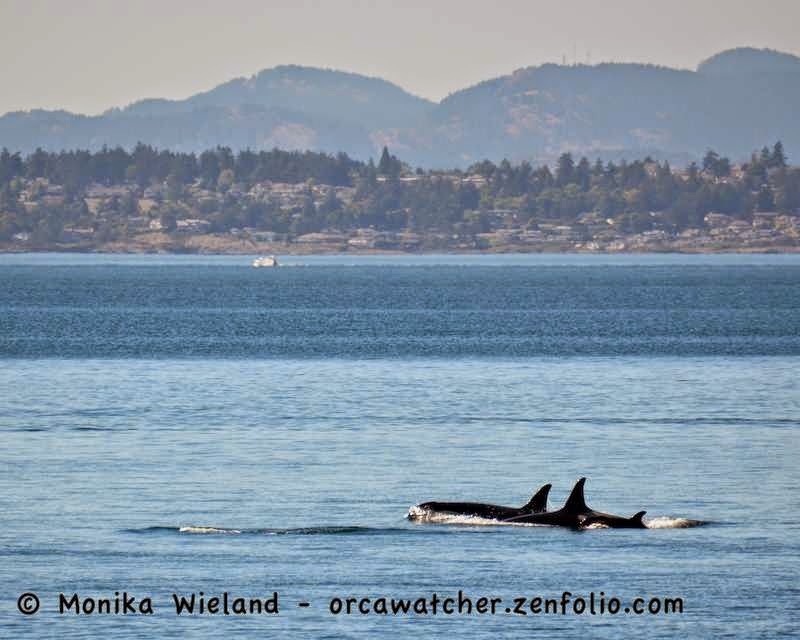 The whales did turn up late morning heading towards the south end of San Juan Island, so I went back to the west side for lunch. Bingo! My timing was right on. 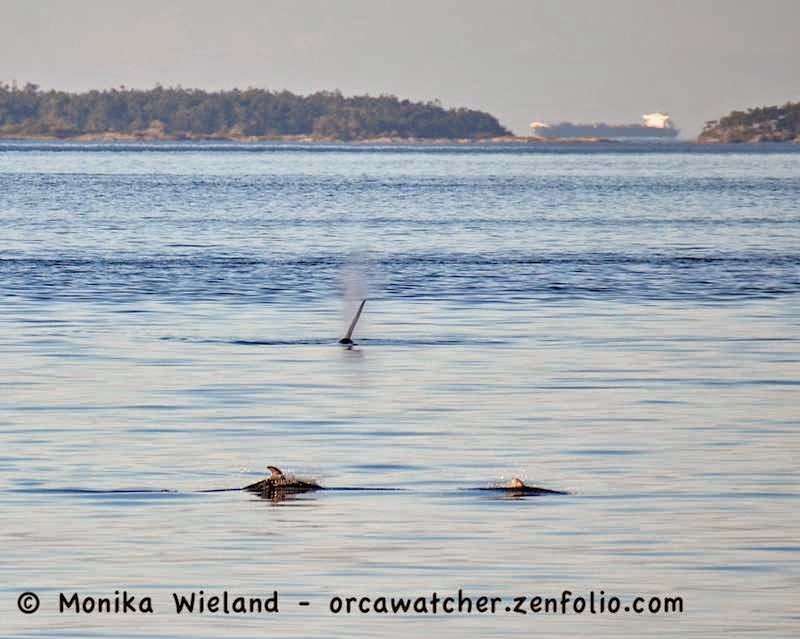 I saw some whales heading north towards Lime Kiln, and assumed they were probably Js, who are usually in the lead. 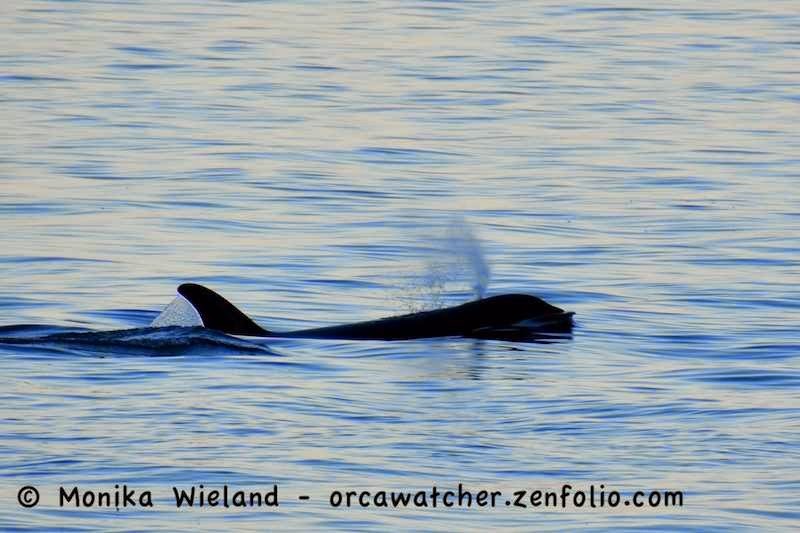 Then the guy next to me on the rock, who was looking through binoculars, said, "There is a very small whale in there..." Could it be?! Yes! It was new baby L120 and family! J49 has been the "baby" of the community for some time now, but he's over two years old. 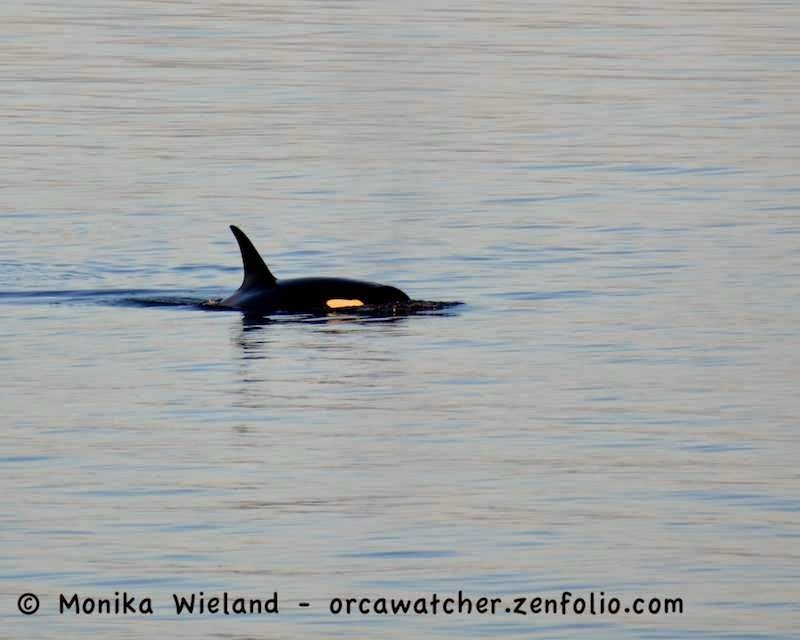 It's been a while since I've seen such a young calf - it was noticeably a very tiny killer whale! 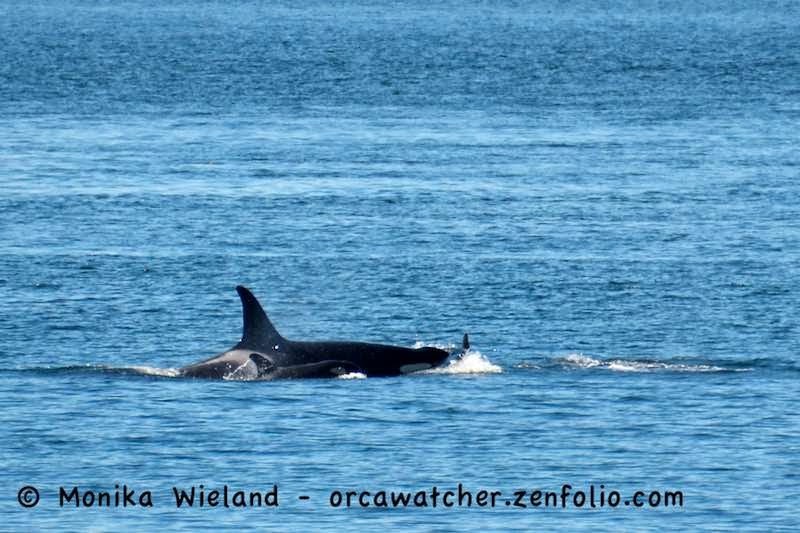 As has been the case seemingly since L120 was born, probable aunt L27 Ophelia was right by the little one's side as well. The rest of the family was close by, too. 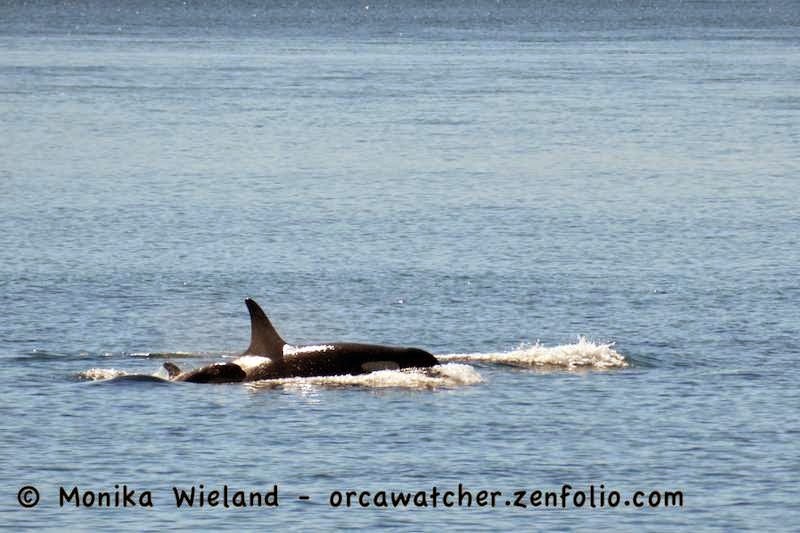 They got up just past Lime Kiln, then turned and went back south, so we got to see the little one twice! Can't get enough of these baby pictures, even if the lighting wasn't the best! 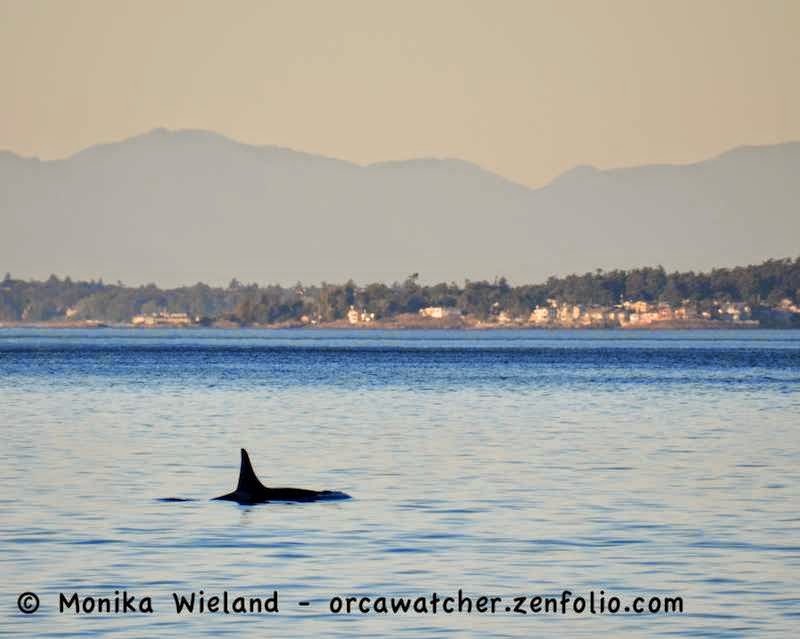 Right before the Ls turned south, another whale came just up to the kelp at the south end of Lime Kiln. I couldn't tell who it was because I only saw her head-on, but I heard from a friend who was further south that it was J2 Granny! She got close enough that I could see her saddle patch underwater, and she literally came right up to the edge of the kelp then turned around under water and went back south. Mt. 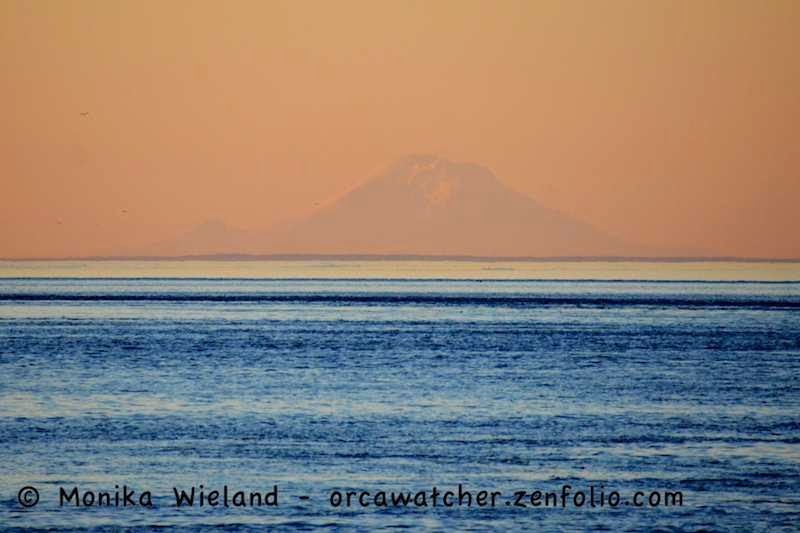 Rainier - 130 miles away! Lags are common further north in BC but for some reason we rarely see them in the San Juans, though there have been quite a few sightings of 1-3 animals this summer. I've seen lags in BC, but this was my first time seeing them in the San Juans, so I was pretty excited! 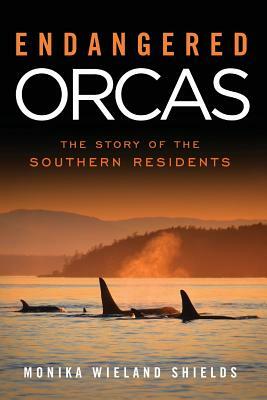 They're one of the only things that could entice me to look away from the orcas! Lags have two speeds: fast, and faster. 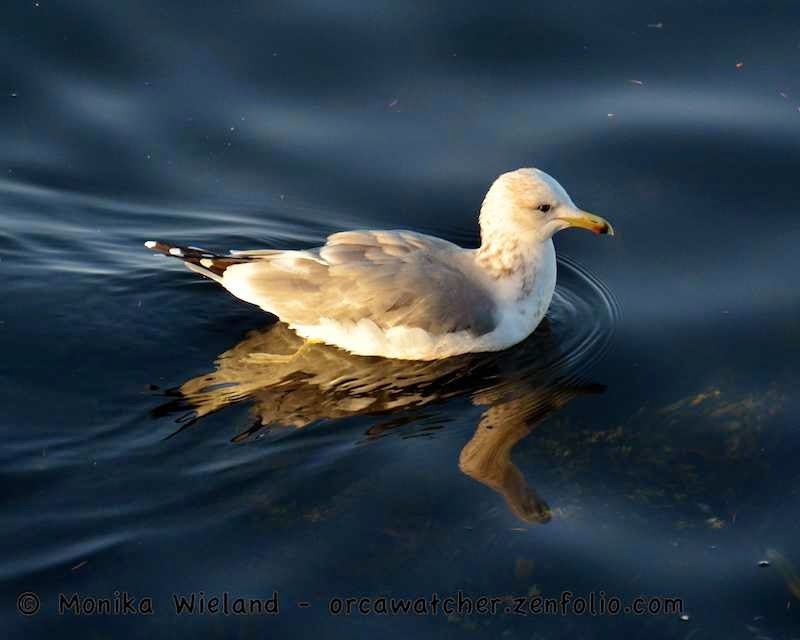 They zig-zagged this way and that, and actually came fairly close to shore! 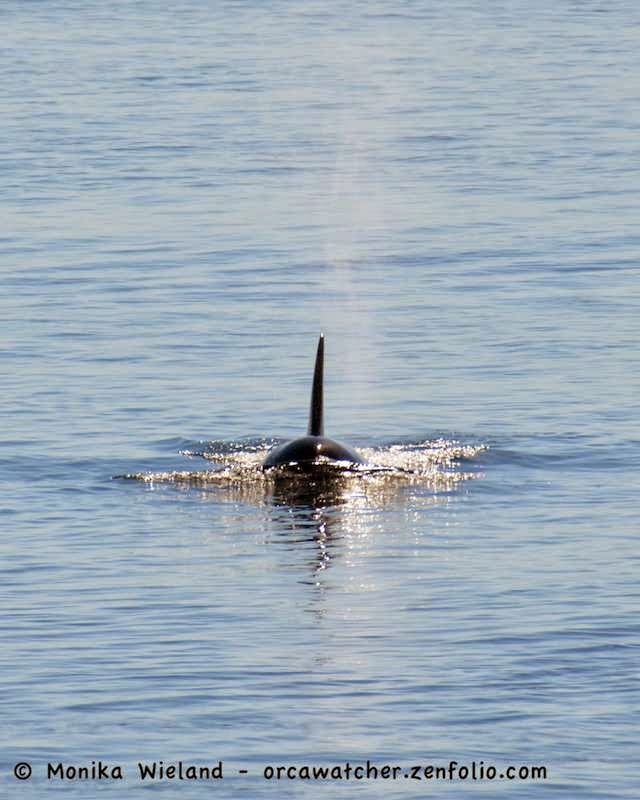 ....but when J26 Mike surfaced, they made a 90 degree turn and headed straight for him!!! 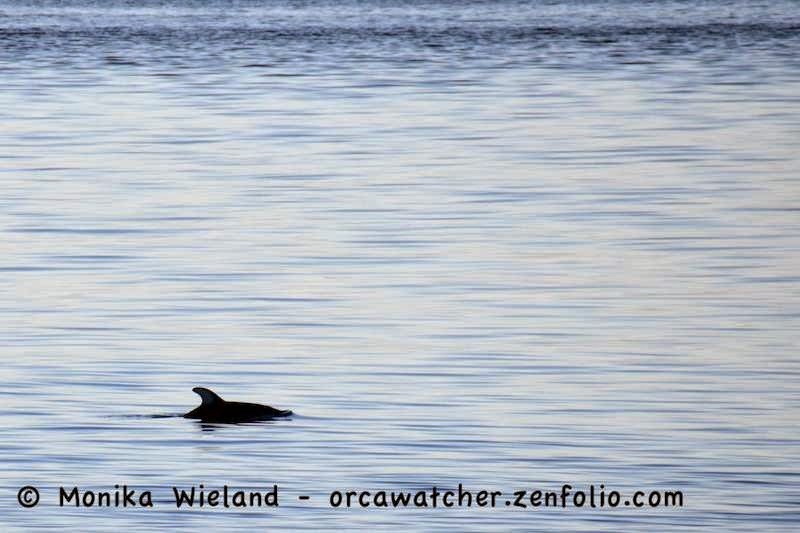 He proceeded to go down on a long dive - we didn't see him again for something like seven minutes, and the lags proceeded on their way north. So cool to see a little bit of inter-species interaction, even if we have no idea what it means! 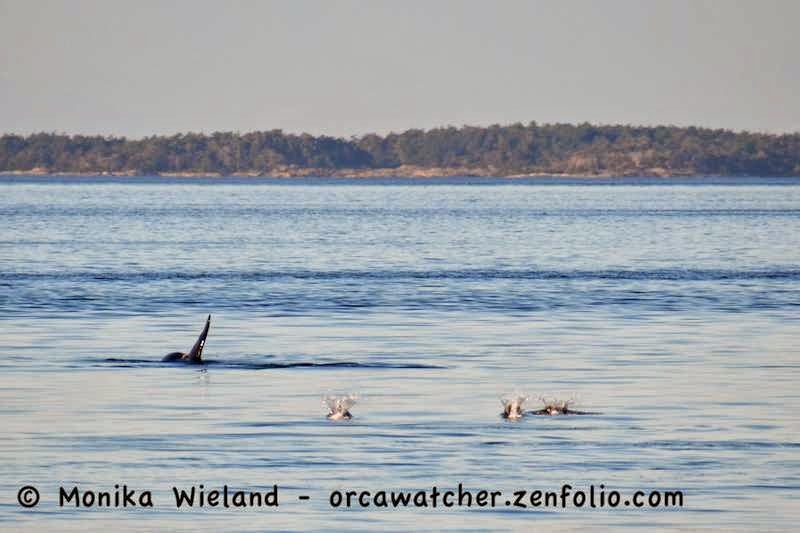 More whales were visible to the south, and would remain so for the next several hours, but they never came up north. 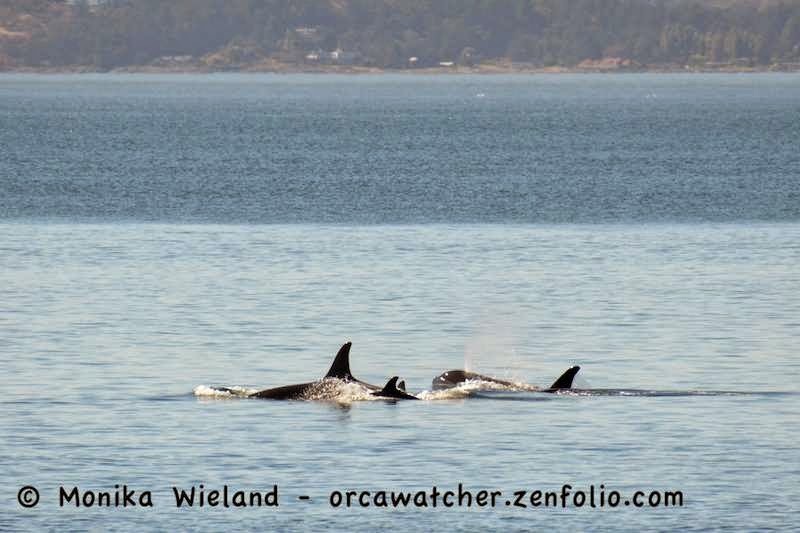 The J16s were the last whales to actually pass Lime Kiln, rounding out J-Pod Group A and continuing north. I'm just in love with being out at Lime Kiln early in the morning. The sightings have been fantastic, and I know such mornings are limited before it gets too dark and cold to hang out there! The lighting is so magical, no matter what you're looking at. The photo of Mt. Rainier is fabulous, even if "it doesn't do the mountain justice"!